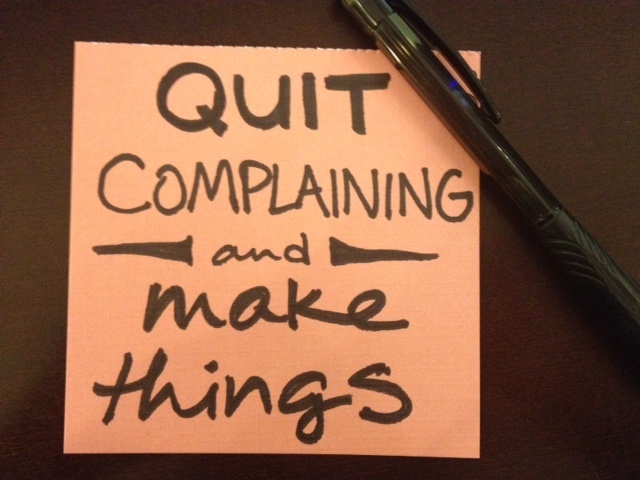 Quit complaining and make things. If I could give 2014 a theme, this would be it. No, instead, I’m going to throw out a short list of things I definitely want to do this year, that I definitely can do. Once a week, post a sketch of a character. It doesn’t have to be inked, or fancy, I just have to post something. Set aside $20 every paycheck for a GET OUT OF TOWN fund – I am always complaining that I don’t have enough money to run off to the beach for a few days or whatever. Well, this is a very do-able way to alleviate that. Every time I get paid, I’m going to withdraw a twenty. So there. Have lunch with family members once a month – I have extended family members that I really want to spend more time with. So I’m going to take the initiative in scheduling that time. Finish painting my bathroom – something I should have had done for like, two years. I’ll tackle this in the spring, when I can comfortably leave windows open to alleviate the fumes. Enter The Thief into Amazon Breakthrough Novel contest – the date of entry for this hasn’t been announced yet, but I’d like to enter my book into this contest just to see how well I’d fare. I mean, it can’t hurt, right? Get o-toro at a good sushi place – Fatty tuna. One of the finer things life has to offer to your tastebuds. One of the very few foods I feel is worth its price tag. I haven’t had any in years, and since I turn 30 this year, I feel it’s a good time to have some. I may have to go out of town to do this properly. Once a month, cook a favorite (or new) thing and tweet the progress/blog the recipe, like I have with pork and apples. This month’s will be seafood chowder. I also have a list of things I want to cook before the year is over, but the notable one is “make tiramisu from scratch.” That means making my own ladyfingers and everything. I know people who have done this, so I can get tips, which is nice. Tiramisu is one of the few desserts in this world I cannot say no to, but I’ve never made it myself. It’s time to remedy that. And yeah, there are ethereal things I’d like to do, like get back to walking when it stays light later in the day (i.e. when I get home from work), do more cooking (which the “make these things” list should help), de-clutter my possessions – but I’m not going to beat myself up for not “accomplishing” these things, because they’re not solid benchmarks, and therefore cannot truly be accomplished, no matter how well I do with them. I’d encourage you to go make a list of highly-accomplishable goals that you can check off as you go through the year. It’s pretty satisfying. Tags: Archetype, DRAGON. Bookmark the permalink. Previous post ← Buy THE THIEF on Amazon! Because of reasons!